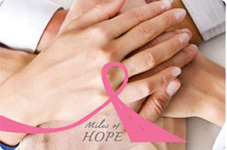 The Miles of Hope Breast Cancer Foundation announced today the awarding of grants to local organizations. Miles of Hope, with a mission to fund support services for people affected by breast cancer within the eight counties of the Hudson Valley, awards grants twice a year to local nonprofits. $10,000 was awarded to Cancer Support Team of Mamaroneck, NY, to enhance the delivery of home-based services for breast cancer patients, including massage, reflexology, nutrition counseling, yoga, therapeutic touch, Reiki, and wigs for treatment-related hair loss. $7500 was awarded to the Northern Westchester Hospital, Mt. Kisco, NY, for a Breast Health Initiative for Underserved Women to receive free, accessible, comprehensive and timely breast health services from education, screening, risk assessment and intervention to diagnosis, state-of-the-art treatment and follow-up. $15,000 was awarded to Support Connection of Yorktown Heights, NY, for a Peer-to-Peer program providing professional counselors for women with breast cancer, offering support, assistance, education, service referrals, and support group information. Peer-to-Peer Hotline: 800-532-4290. $2500 was awarded to the Tennis for Life program in Rockland County, NY, for free tennis lessons, organized tennis matches, peer networking groups and professionally facilitated discussion groups for breast cancer patients and survivors.